Marketing your summer camp is fundamental in maintaining and increasing attendance. Whether you are operating an sports camp, arts and crafts camp or an athletic camp, finding ways to grow the number of attendees is important to making a profit and staying in business for the long term. In a world that focuses on social media, video games and technology in general, camps capture the attention of the younger generation. Creating an action plan that can attract children to attend a camp may seem like an impossible task when kids today are glued to handheld devices and technology. To make your planning easy, we’ve gathered the best marketing techniques that will specifically help you as a summer camp owner. We’re here to help build your camp’s reputation and attendance without having to break the bank. When creating a marketing plan, you must first pinpoint your target audience. For summer camps, you will have two main groups to advertise to: the children and the parents. Two different audiences means that you will have to create separate marketing strategies for each. We’ll go through, how you can target each group to help them see why a summer camp is something they should strongly consider. In essence, you will be creating a push/pull marketing plan, which will allow you to reach both audiences simultaneously. Your tactics to children will be more push marketing while drawing parents back to your camp or new parents through word of mouth referrals will be more of a pull marketing strategy. Knowing how to market to children and their parents will give you the most effective marketing campaign and greatest chance at success. Captivating attention of the younger generation involves advertising to their likes and needs. To do so, focus your advertisements on the fun-filled activities your camp has to offer and the ‘feel good’ atmosphere of the camp. Potential campers need to know the ‘why’ behind attending your camp, so advertising the highlights of what you have to offer is the best way. Put yourself into the parents and children’s shoes, think of what they want to see and what would bring them to your camp. Marketing that is geared towards children and teens must motivate them to act, which in many cases is talking to their parents to support their interest to attend your camp. Having a call to action, usually a link to a website, will help you to advertise towards both the young and the old. Focus on incentives that parents will be inclined to follow, such as deals, skill development, and unique opportunities for children to grow as individuals. Marketing to parents should give them the answer to, “Why should I sign my child up for this camp?”. Your marketing should help them realize that the summer camp will be more beneficial to their children then mobile devices on the summer break. Knowing the audiences is the first step in creating your plan. The location/area your camp operates in, or the communities that are in the area of your camp are the prime spots to begin your advertising campaign as you are advertising in the area to local families that the camps are on. This will give you the exposure you need to build locally before you decide to expand to a broader geographic area. Parents of such kids may also be more at ease sending their children to a summer camp that is really very accessible given an emergency. There is no shortage of opportunities to market your camp to these local kids and parents. Implementing signage into your advertising campaign is the oldest trick in the book. This timeless approach to advertising will give you limitless possibilities for indoor and outdoor marketing. Signs can be used to advertise camp locations and dates of the camp. If you’re having your camp at a school or a local community center, you can fit banners or place signs on the property to advertise your camp. As mentioned, use opportunities to give clear sign-up information and links to websites. Pavement Signs or teardrop banners all work great to draw the attention of potential event attendees. Attending local events will also boost your influence within a community. Treat events as prime marketing opportunities, creating displays at fairs or community sponsored events that will attract potential attendees to your booth and ultimately your summer camp. Roll Up/Pop Up banners and corriboard signsare excellent for indoor fairs, while mesh or pvc banners make for great outdoor advertising. If your camp has a fixed location that you wish to advertise at, you can implement aluminum or corriboards signs for a longer term display. No matter what your display needs are, there’s a sign that will satisfy that requirement. With camp attendees being of school age, joining forces with Creche/Montessori or primary schools is an advantageous marketing move. Building a partnership with schools which will allow you to reach families in one go!. Schools can be places where posters, signs, and promotional material such as flyers are handed out to students or easily seen in corridors and classrooms. Partnering with schools is a win-win for both your camp and the school. Provide handouts for students to bring home, which will double as a reminder as well as a way to invite parents to check out the camp as well. These handouts should provide information on your camp, including costs, important dates and deadlines, as well as a sign-up form to send in. The influence of online marketing and media is impossible to avoid, especially with its ability to reach your target audience instantly and effectively. Harnessing the power of the internet can be done in a variety of ways, including blogging, social media, and online targeting. Increasing your social media presence will help you convert online traffic into actual sign-ups for your summer camp. With so many tactics to use in the digital marketing field, we’ll help you narrow down the online tools that will help you increase camp attendance most effectively. Making your website the hub of marketing activity is your highest priority. When visitors come to your website they should be able to easily navigate your content and find what they are looking for. First and foremost, your main page should instantly grab attention. Eye-catching images, limited time discounts, and other call to action items will give visitors reason to stay on your site and navigate to other pages. The goal of your website is to convert visitors, both children and adults, into committed campgoers. Use your website as a platform to post testimonials from past camp attendees, add Photos, videos, and other experiences can help entice both parents and children to sign-up for your camp. It’s been proven that Facebook, Twitter, and Instagram are the go-to social media outlets for your target parents. Studies have shown that these platforms are where parents spend the most time on social media, so focusing your efforts on these social hotspots will help you reach more parents. Knowing how to maximize the productivity of your social media efforts will widen your influence. With so many different platforms to use, it’s important to know how some of the more popular ones fit into the grand marketing scheme. Facebook – Whether you have a Facebook page already created or not, you must implement a plan for your page. Marketing on Facebook goes beyond sharing your page with other users and getting ‘liked’. 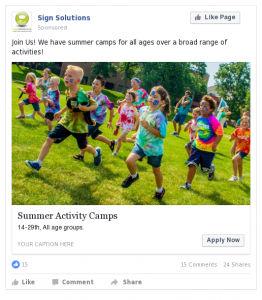 Facebook is an ideal platform for interacting with users and informing the general public about what you offer as a summer camp. Also, every camp should encourage sharing of your page and posts by your followers to further expand your reach on social media. Twitter – Marketing with Twitter should be concise, yet descriptive. Twitter is a platform that revolves around a constant stream of information being consumed by users, so regularly updating with links to videos, testimonials, and deals will be highly effective. Use hashtags that are relevant in your local geographic area to connect yourself with other local businesses and groups, which will help to build a network of partners to spread your message. Instagram – It’s clear that Instagram marketing is centered on images and video clips. Visually communicating your summer camp is dependent on quality photographs and videos, meaning that you will need to staff a camp photographer or learn how to use your phone’s camera to its full potential. In any case, photos and videos should capture the emotion of your camp. The goal for your posts should be to invite users to act, so include links to your website and other social media profiles in the posts you create. Those ads that pop up on the as part of websites you visit and the search results on Google can also be used to help market your summer camp. AdWords gives you the freedom to market to specific demographics and geographic areas, which is perfect for a summer camp looking to increase exposure. Setting up an AdWords campaign is straightforward, making it a hassle-free experience advertising online. The only drawback to running an Adwords campaign is that each click on an ad will cost you money. This means that it could be very costly if this tactic is not used correctly.. While it is a very powerful method it is one that needs to be carefully managed for any kind of camp on an advertising budget. Along with AdWords, a variety of social media websites have adopted a similar advertising technique that uses ads that are displayed or presented on their social platforms. Here is an example of an tweet of a summer camp organization. 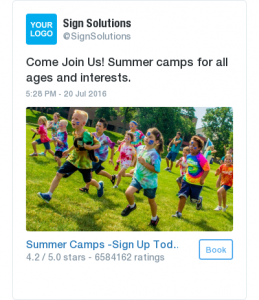 Tweet or advertise with promoted tweets on Twitter to reach your potential camp attendees or their parents. This is an example of a summer camp advertisement on Facebook. AdWords can go hand in hand with your social media pages and website. Use ads to direct people to your website, which you can set up specific landing pages that offer unique discounts depending on which ad they clicked. Design ads that use call to actions, just as you would use for landing pages.